Every MAN deserves comfort – and no that’s not being sexist, it’s MAN trucks for men and women lorry drivers we’re talking about. Gone are the days of a blanket and stretching out over the truck seats. These days drivers need home comforts in their cabs. And that’s in part where Victron Energy comes in. 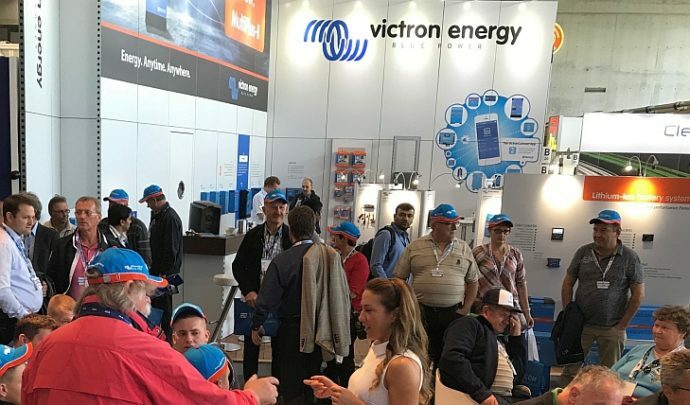 This year’s recent Automechanika and IAA Commercial Vehicles exhibitions where Victron Energy had a strong presence, demonstrated the demand for comfort providing electrical systems. 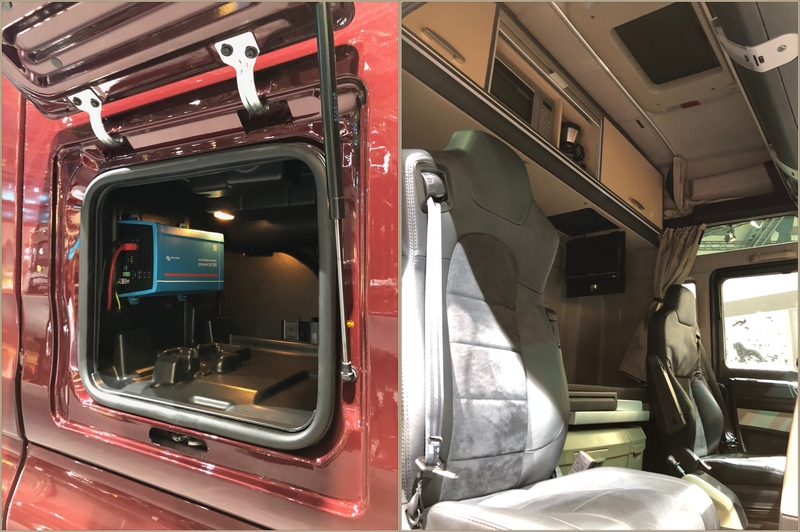 To accommodate that demand, the Victron stand included Blue Smart Chargers, the BMV-712 Smart battery monitor with Bluetooth built in – which communicates via the free VictronConnect app. The new MultiPlus inverter/charger product range was also a great success. It’s apparent from these shows that the requirement for additional power electronics is increasing rapidly for products such as inverters in lorries and small commercial vehicles, which can provide AC power to a microwave for example – or even a hairdrier! 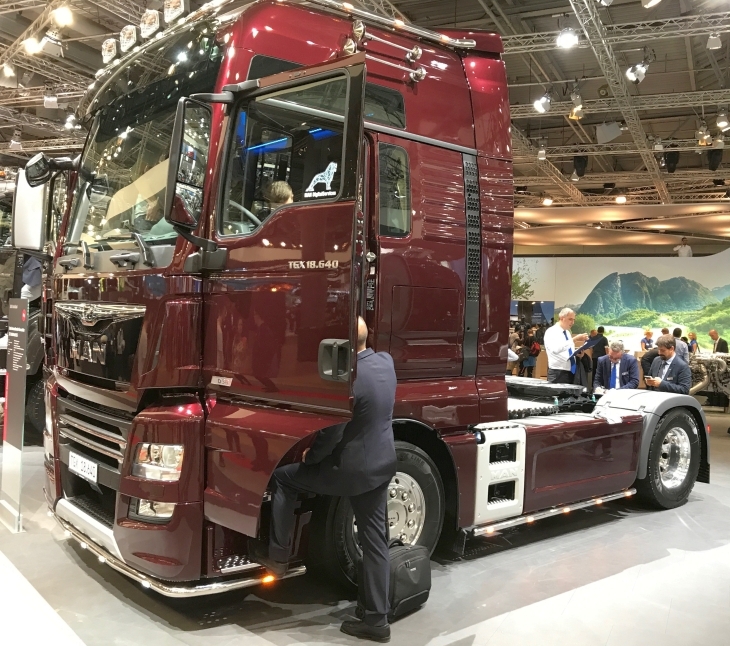 MAN Comfort – At the IAA show MAN displayed their TGX 18.640 truck. The cab has a ‘kitchen’ extension where 230V equipment is powered by a Phoenix 24/1200 VE.Direct inverter. 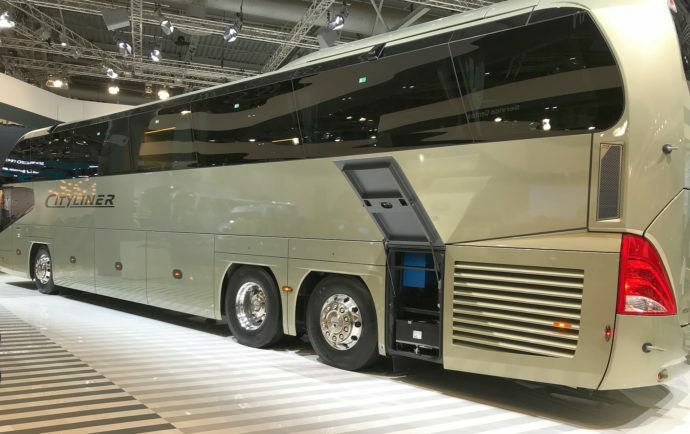 Many others companies exhibited too – among them MCV from Egypt, Bott, Scania, Neoplan and Bofrost. Victron products fitted to commercial vehicles by VW Bofrost (left) and Bott (right). Victron Sales Managers for Germany, Uwe Dräger and Bob Hopman would like to thank everybody that visited our booth at one or both of the exhibitions. “Starting with the smaller Victron products, the demand for our high quality IP65 chargers has increased as more and more vehicles fit a secondary battery, in addition to the starter battery to run various ancillaries. Previously vehicle owners have progressively been loading starter batteries with ancillaries and when these can’t cope it has become common to fit an additional battery. That’s all well and good but if these ancillaries are used when stopped they can drain that additional battery – hence plugging into the mains with our IP65 chargers to charge that battery ensures plenty of extra DC power for ancillaries. Also as more Lithium batteries are being used for ancillaries due to their lighter weight, energy density and ability to handle higher loads – that has presented charging difficulties as Euro 6 vehicle standards block simple charging by an alternator. In such cases people are turning to our battery to battery charger solution (Buck-Boost DC-DC Converter) ensuring charging from the alternator.